Seedrioru observed the 100th anniversary of Estonia’s independence with a traditional song festival on June 30. 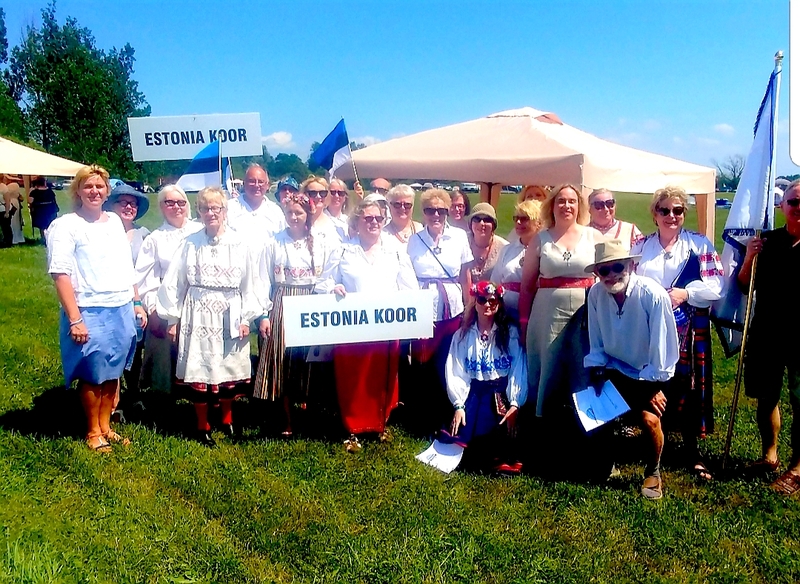 The Estonian Choir, along with several others, showed their inimitable musical mettle by participating and challenging the exhaustive 100-degree venue. No signs of any wilting by these singers. Photo: Siobhan Giles. I grew up in Northern Ontario. My parents were Estonians who came to Canada in the late 1940’s after a stay in a German displaced persons camp. There was a vibrant Estonian community in my northern gold mining hometown, just as there were vibrant Ukrainian, Polish, Latvian, Italian, Finnish, Chinese and French-Canadian communities. The local schoolboard was intimidated by the number of different cultures and languages in play, and discouraged the new Canadians from teaching their children their native language. Unfortunately, this raised the dilemma in me that has followed me all of my life; how to be a “Good Estonian” when I couldn’t speak the language. So, I learned to cook and bake. I’ve dedicated years, even decades, to mastering the foods that I grew up with at ema’s table and under her hand; golden pirukad and tart rabarberikook, mustikakook with wild blueberries and crisp piparkoogid, hapukapsas, all kinds of suppid, kohupiimakook, sweet cardamom rich magussai, and dense earthy rukkileib. My family appreciated my journey of Estonian self-discovery, but I still did not feel enough of a “Good Estonian”. Then two years ago I discovered Estonia Koor. I joined, as a tenor, with the plan to make the trip to Estonia to participate in the 2019 Laulupidu. I’ve sung all of my life, but never in the Estonian language. If I could sing in Estonia, in Estonian, in a choir of 30,000 singers, would I finally measure up to the bar I’d set for myself? Would my dear ema stand next to me in spirit, perhaps singing in harmony? Would I find the bit of myself that has never quite felt like I measured up? The voices of my parents were in my ears as I sounded out the words, at the same time both alien and familiar. By the time our spring concert came around, I was singing loudly and confidently. I know my ema was with me. I could feel her hand, rough from gardening, holding mine. Bringing my hand up to my face, I could smell her Avon hand lotion. Well, I’ve not yet set foot on the song festival grounds, but these last two years have already given me such confidence and a renewed sense of being Estonian. No one finds my lack of Estonian language to be a problem, and they quite appreciate the baking that I bring to choir practice to share at our mid-rehearsal breaks. The other part of being a “Good Estonian” is feeding family and friends, and the Estonia Koor is both of those things to me. Next year, at Laulupidu, I will sing with my new family around me, and my old family among the thousands there to listen to the waves of music pouring over them. We will, all of us, breathe as one. We will hold hands and sway, we will cry, and our voices will never waver. We will be held up by the strength of our ancestors whose voices will be added to ours. I will meet and embrace cousins that I have only previously met on Facebook. I will compare the koogid and saiad and leivad of Estonia with my own, and will not worry if mine don’t quite measure up. Rather, I will come back home armed with new ideas that I can share with the koor the following year. And having set foot on Estonian soil, and having breathed Estonian air, and having sung among Estonian voices, I will be a “Good Estonian”. 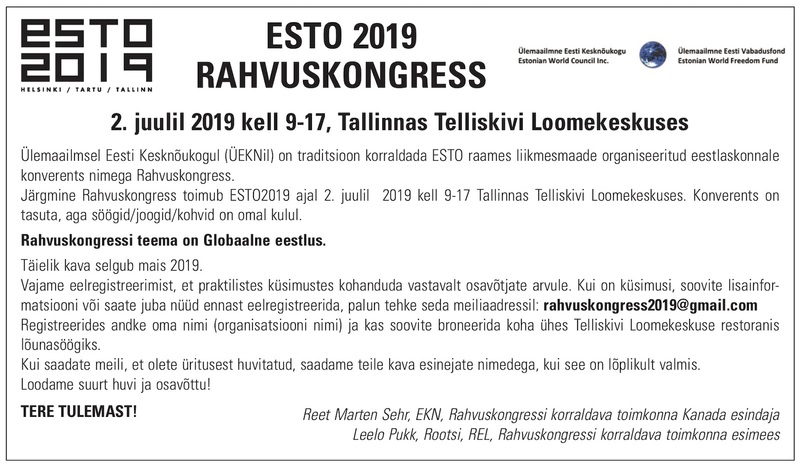 I invite all interested singers to join me at Estonia Koor as we prepare to participate in the 2019 Estonian Song Celebrations. Rehearsals are held Thursday nights from 7:00 - 9:30 pm at the Estonian House, 958 Broadview Avenue. Our first rehearsal is on Thursday, September 6. For more information, please contact Riina Klaas, 416-444-5613 or See e-posti aadress on spämmirobotite eest kaitstud. Selle nägemiseks peab su veebilehitsejas olema JavaSkript sisse lülitatud.. Be sure to visit our Facebook page or YouTube channel!